CACTUS: Cactus, the common name for a family of desert plants. The plural is cacti or cactuses. Most species bear sharp, needlelike spines, which protect the plants from foraging desert animals. Cacti are famed for their ability to resist drought, which they owe to the fact that moisture from inside the plant evaporates very slowly through the plant's skin. Cacti grow in hundreds of different shapes. The fibrous, juicy stems may be globular, cylindrical, branched, trailing and vinelike, ribbed, grooved, or knob-bearing. Only two species have true leaves. The rest of the 2,000 species are leafless. Why are some cacti grafted There are several reasons grafting is done. Some cacti are difficult to grow on their own roots in cultivation. Mutant forms are rare and grafting makes them more available to the collector. Seedlings that lack chlorophyll need to be grafted for their survival. Some species of cactus have very slow growth rates on their own roots, but grafting to a more robust species accelerates their growth rate. Many people tend to think that cacti and succulents are too difficult to care for and decide against even buying them. As it turns out, many people are simply caring for them too much or too often. Cacti and succulents will do quite well under the same conditions which would be considered neglect with other plants. -Watering- The most common problem people have with cacti and succulent plants is overwatering. They are 'water storing' plants and will do better with less water than they will with more. Since every situation is considerably different, there is not set time interval for when to water cacti and succulents. Many factors play a role in the timing (such as humidity, light, and temperature). General Rule: Water Cacti and succulents thouroghly and allow them to dry out completely between watering. If you are not sure if the soil is completely dried out it is useful to stick your finger in the soil (1" or so if necessary) to see if the soil is dry. Many plants will be potted with a sand or grit topping, be sure to check the soil for moisture, not just the topping. If you are still not sure and think it may be too moist, don't water it! Overwatering can lead to disease and rot and will kill your cactus and succulent plants! -Light- Cacti and succulent plants love bright sun and will do quite well on a windowsill or on a porch. There are some species however, that will do better in the shade, or partly sunny places. These include some species of haworthias and aloes. If you think your plant is being dried out or damaged from the direct sun, move it to a less bright location. If you have a plant in a location where there is little or no sunlight and notice it is stretching, it is a good idea to move it into a brighter location. 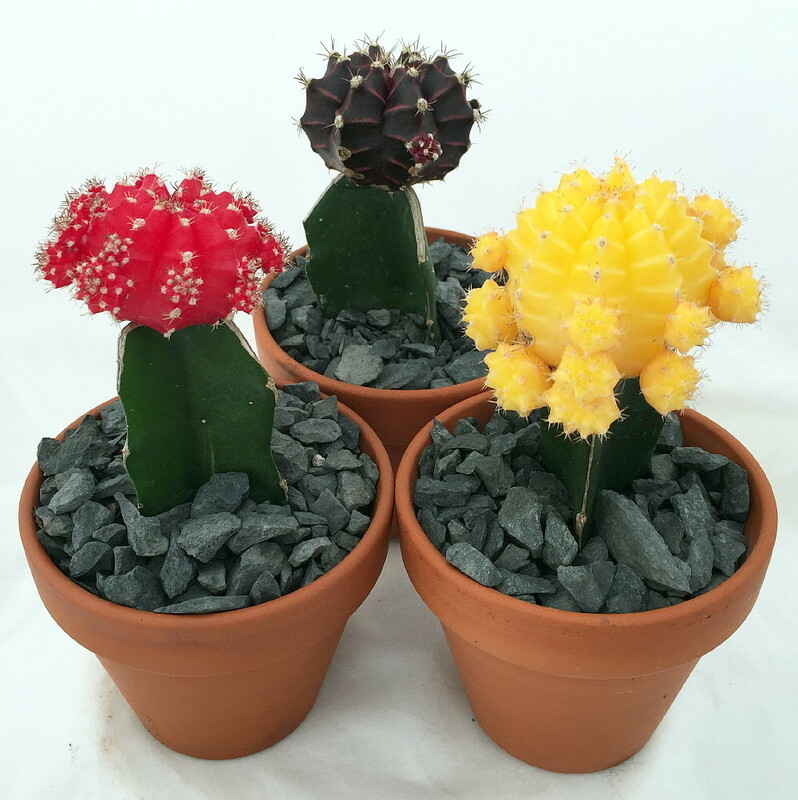 -Temperature- Cacti and succulent plants can survive a wide range of temperatures, but it is preferable that they are kept in a warm bright location for the best results, and the most beautiful color. There are some species of cacti that are actually 'winter hardy' and can survive in temperatures well below freezing. If you are not sure that your plant is winter hardy, do not attempt to leave it in the cold! Most species of cacti and succulent plants will do well in a location where the temperature ranges from 40 F to 95 F.